Eternal Darkness: Sanity’s Requiem is what happens when a bunch of Lovecraft nerds get control of a studio and make a game. It has everything, from hideous ghouls to nightmarish elder gods to characters slowly going insane during their adventures. It portrays all of this by expertly using cinematic techniques alongside clever video game design, giving us one of the best games ever made. Welcome to “BACK IN MY DAY”, where I look back at old games that I loved as a kid or I feel were important to game history, but may not get the credit they deserve. Also, GET OFF MY LAWN, YA YOUNG PUNKS! The game is indebted to classic film techniques to achieve this illustrious accolade. Several types of camera manipulation are used in conjunction with its oft-written sanity effects to heighten the tension of the experience and to immerse the player in the world of the game. Let’s take a look at the game from a film making perspective to see why it’s such a great piece of interactive storytelling. Tilting the camera so that the shot is a little crooked, a little askew is called a “Dutch tilt”, which was made in, you guessed it, Germany. (“German” in German is “Deutsch” which sounds like “Dutch” and people just rolled with it) This camera effect gradually increases as you lose more and more sanity throughout the game. In classic horror films, the more pronounced a Dutch tilt, the more it conveys the idea of instability, especially if it is paired with a close up of someone’s face. In this clip from Evil Dead 2, Ash Williams (Bruce Campbell) starts off at the edge of sanity, and with one slight mishap, he plunges headlong into madness. The camera is mostly kept straight up and down at the beginning, but tilts dramatically throughout the rest of the scene. By the time Ash is dancing with the laughing lamp, the camera is tilted by at least 30 degrees, which showcases his newfound mental instability. It’s meant to destabilize the world on screen, up-heaving the ground from underneath the characters. Eternal Darkness achieves this sensation to great effect, and it exaggerates the creepiness of mundane experiences, like walking down a hallway. When this happens, it feels like you’re trying to ice skate uphill, which makes evading demonic enemies who have sharp claws and big, nasty teeth all the more thrilling. It confuses the player, especially if they were mostly sane beforehand and now have to backtrack in a topsy-turvy area that fine a minute ago. A floor made of screaming faces and a book bound in human skin. Seems totally normal . Many of the rooms the player enters have the camera positioned from a high angle, which not only gives decent coverage of the room, but also constantly looks down on the player’s current character. We look down upon them, making us see them as somewhat weak, which is exactly what we should be seeing them as. They’re mere mortals going toe-to-toe with extra-dimensional creatures that could easily murder them where they stand. These consistent high angle shots bolster this sense of caution and trepidation, highlighting the David v. Goliath nature of the game. While it can be problematic at times when searching a room, this camera positioning keeps the foreboding mood of the game intact. What truly elevates game from others like it is how it not only messes with the player’s character, but the player themselves. The A.V. Club has an article that documents how Eternal Darkness is an evolution of the gimmicky sci-fi films of the 1950's, and both the game and those old movies do their best to play with their audiences. Meta-game tricks have been around for a while now, with the scene involving Psycho Mantis from Metal Gear Solid being a go-to example for many. Most games that utilize this tactic use it sparingly, using it only to heighten its shock value when it happens. Eternal Darkness revels in these interactions. All of the sanity effects if you don’t want to experience them firsthand, scaredy-cat. The volume muting suddenly, deleting your files instead of saving them, and a blue screen of death are ways that the designers target the player in the real world, and not just their character. These tricks are admittedly gimmicky, but they are done so well (and only when your sanity is low) that the novelty doesn’t wear off. Instead, a weariness of what will happen next sets in, building the tension as the player attempts to survive the elder god’s onslaught. Eternal Darkness learned from past interactive stories and utilized the technology it had its disposal to make an immersive masterpiece. The game doesn’t just rely on gimmicks, but a whole arsenal of cinematic techniques to keep players on edge. The designers relentlessly worked to craft a game that stood out from its peers and made an indelible impression on the industry. 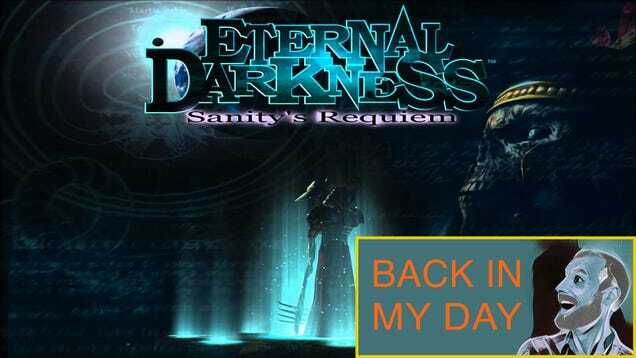 Eternal Darkness plays with you as much as you play with it, and that’s what makes a classic.